In small bowl, beat eggs and water with fork or wire whisk until well mixed. In 10-inch nonstick skillet, melt butter over medium heat. Pour egg mixture into skillet. As mixture begins to set at bottom and side, gently lift cooked portions with spatula so that uncooked portion can flow to bottom. Cook 3 to 4 minutes or until eggs are thickened throughout but still moist. Remove from heat and keep warm. Spread refried beans and salsa on tortillas to within 1/2 inch of edge. Sprinkle with cheese. 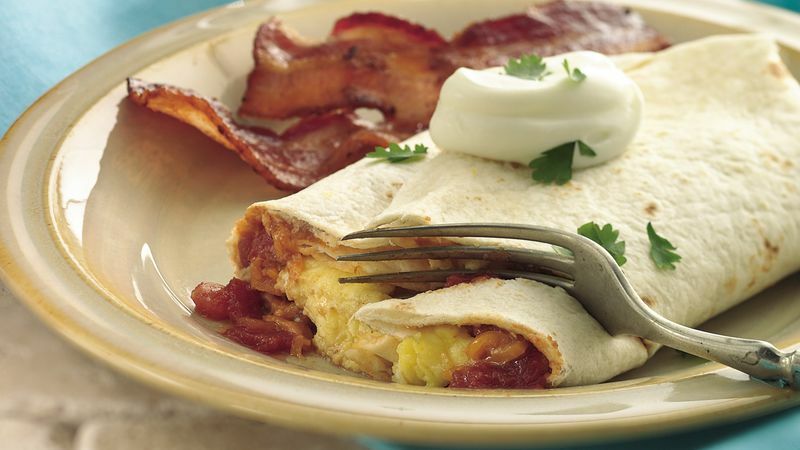 Place on microwavable plate; microwave each burrito uncovered on High 45 to 60 seconds or until tortilla and beans are very warm and cheese is starting to melt. Cut eggs in half. Place each half on center of each tortilla. Fold top and bottom ends of each tortilla about 1 inch over filling; fold right and left sides over folded ends, overlapping. Cut each burrito in half. Serve with sour cream and cilantro.